Mick O’Dwyer and Glenn Ryan look ahead to Sunday’s All-Ireland quarter-final. Coach and captain: O'Dwyer and Ryan were in Dublin yesterday to look ahead to the big game. FOUR SHORT WEEKS ago, Kildare fans would have made the trip home from Croke Park disillusioned, deterred and defeated. They’d just watched their side being bullied off the HQ turf by a Dublin side that eventually racked up five goals to run out 19 point winners. It was a demolition in every sense of the word. After relegation to Division 3 earlier in the year, Kildare football, quite frankly, could hardly have slumped to a lower low. The critics had been given enough ammunition and were ready to aim fire but Jason Ryan’s charges have dragged themselves from the brink of oblivion to an All-Ireland quarter-final – their first since 2012. Indeed, you would forgive the Lilywhite faithful for making alternative plans for the August Bank Holiday weekend but instead they will be making that short journey back to the capital infused with a renewed sense of optimism. Even the most bullish supporter could hardly have predicted a revival of this scale. Over the last month, Jason Ryan’s side have built up a head of steam after safely negotiating the first two qualifiers as they embarked on a purposeful redemption mission. But then they were paired with Cork. Stopped in their tracks, we thought. “When the draw was made, you expected Cork to win that one,” Mick O’Dwyer says. The legendary manager is sitting across a boardroom from Glenn Ryan, his former Kildare captain, as the build-up to the weekend’s games intensifies. What Lilywhite fans would give for those two to be involved on Sunday – O’Dwyer patrolling the touchline and Ryan doing the same on the pitch. O’Dwyer masterminded Kildare’s last championship win over the Kingdom in 1998 while Ryan played an integral role the last time the county reached such lofty heights. But, the current crop aren’t doing a bad job themselves. “As a player, you’d look forward to August. You know that’s when the serious business starts,” Ryan begins. O’Dwyer adds: “You get to August and it’s a job well done. A bit of luck decides it after that but with a bit of hard work, you’ll go places. It’s difficult to put a finger on what has led to Kildare’s change in fortunes over the last few weeks. Ryan thinks it could be down to something as simple as stumbling across a winning habit. “They obviously worked hard and clearly had a defensive plan in place that they didn’t seem to have against Dublin but you can’t beat winning games,” the two-time All-Star explains. In the most gentlemanly manner possibly, O’Dwyer interrupts to remark that reaching this juncture of the championship summer is ‘a big plus’ for Kildare. They’ve been forced to take the long way around too. In fact, Ryan believes the added games have helped Kildare’s cause as they’ve been able to settle on a game plan and become familiar with it while not having to overextend themselves. There’s no doubt the players will be fully aware of the size of the task that lies ahead. Eamonn Fitzmaurice’s Kerry may not have hit first gear yet but they remain the force to be reckoned with. As you would expect, the All-Ireland champions go into Sunday’s game as red hot favourites as they come off the back of a 77th Munster title. But O’Dwyer, who guided Kerry to eight All-Ireland crowds, insists they won’t be underestimating the challenge posed by Kildare. It’s perhaps a tag which suits Kildare. Ryan believes the circumstances of last week’s game in Thurles meant all the pressure and focus was on Cork and it allowed Kildare to sneak under the radar. “Kildare will go into this weekend with absolutely nothing to lose. After the Cork win they have nothing to fear and should be excited for the game. Of course there’s pressure but they can’t go in with the mentality of being afraid to lose. If Kildare are to defy the odds once again and stun Croke Park, they will need to grasp all their scoring opportunities when they present themselves. It’s easier said than done. “They need to settle quickly,” Ryan continues but O’Dwyer quickly adds that Kildare will, in all likelihood, have to ‘play out of their skins’ if they are to have any chance of loosening Kerry’s grip on the Sam Maguire. It’s hard to disagree. Having produced a remarkable performance just seven days ago, the question on everyone’s lips is whether Kildare can bring their new-found confidence to the big stage? Should Kildare have the final word on the pitch, well then that would truly be the shock of all shocks. 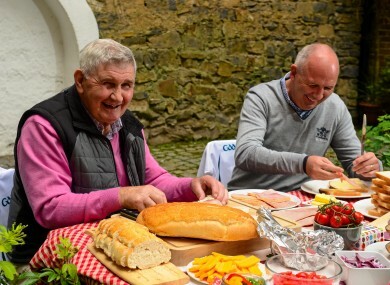 Brady Family Ham, proud sponsor of Kildare GAA, is fuelling football fans and legends, Mick O’Dwyer and Glenn Ryan, for success ahead of the big game against The Kingdom on Sunday. Fans are encouraged to look out for complimentary Brady Family Ham pre-game snacks at Maynooth and Heuston train stations before kick-off on Sunday. Email “We sat down with two Kildare legends to discuss the Lilywhite revival ahead of Kerry”. Feedback on “We sat down with two Kildare legends to discuss the Lilywhite revival ahead of Kerry”.